STAVE provided rich opportunities for lay citizens to actively participate. This is not only an assessment arising from researcher’s accounts; rather it is in line with participant’s evaluations as delivered at the very end of the group process. The overwhelming majority of participant’s comments about the group discussions were definitely positive. Overall, the 18 STAVE interventions have been attended by 157 people. 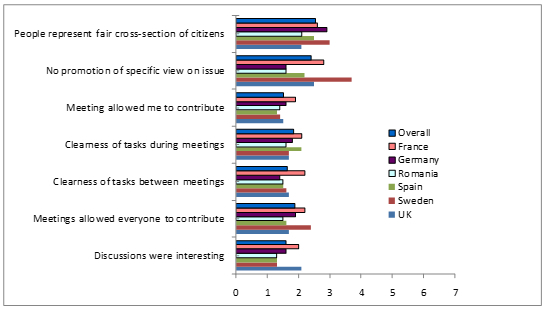 The figure demonstrates that participants have been highly satisfied with the group meetings. In terms of individual and collective opportunities to contribute, clarity of what one was supposed to do and interestingness of discussions on average people across all partner countries almost unanimously opted for the best (1) or second best (2) rank. Both statements regarding the framing and sample representativeness issues also ranked quite positive, but in this regard, participants voted slightly less favourably and on average placed their votes between 2 and 3. The STAVE groups provided rich opportunities for lay citizens to actively participate. This is not only an assessment arising from researcher’s accounts; rather it is in line with participant’s evaluations delivered by them at the very end of the group process when filling in the evaluation questionnaire. The overwhelming majority of participant’s comments about the group discussions were definitely positive. Overall approach: The three STAVE groups deal with the same issue: smart meter (“LINKY”) and electricity savings. A fraction of the French population (250,000 homes) has recently been equipped with Linky by ERDF (the national utility) as a test sequence before the equipment is generalized to serve the whole French population (35 million homes). Participants were drawn from a list of the test population, provided by ERDF. One rural and two urban groups were engaged. The STAVE groups’ composition reflects the ERDF test population: older persons and lower socio-economic status in the rural area, younger and higher socio-economic status in the urban area. A balance between men and women was kept in each group. None of the participants had previously been engaged in focus groups. "Interesting to know the point of view of everyone in the group"
"Very interesting group, diverse and open to discussion. I am willing to participate to other groups of this type"
"There was plenty of time for interesting and frank discussions. 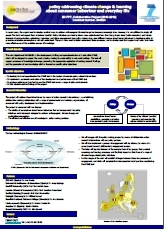 Would be happy to do it again"
"Multifaceted aspects, good working methods (ovals etc.). The conversation was always balanced, I had always the feeling to be taken serious"
"Participating in the groups has made me more alert and aware – future oriented"
1 group of citizens over the age of 35 years and no social problems (STAVE 1). 1 group of citizens under the age of 35 years and no social problems (STAVE 2). 1 group of citizens with social problems (unemployment, low-income families, retired person, single parents, etc.) (STAVE 3). "I was surprised to see the seriousness of answers of the people participating in the meeting, the interest generated, and I think if additional meetings had been planned a collective would have been formed"
"The discussions in the group seemed to me very open, honest, each of us had the opportunity to express own opinions"
"There were several moments in which the discussion of participants deviated from the topic and here I appreciate the ability of the coordinator to bring us again to the topic of the seminar. I thank you. The meetings were very interesting"
"It was very new and interesting and I was pleased to participate"
The policy issue for STAVE 1 in Spain was the Agenda21 and the commitment of the city towards sustainability. In this context, shopkeepers were considered a key actor by the policy partner (as they can play a relevant role in the city’s sustainability). Thus, the first STAVE intervention consisted of a group of shopkeepers from a specific commercial area in the city of Barcelona identified by the City Council (“snow ball” from a shopkeepers association in the area). All these shopkeepers sell quite different products: ice-creams; ecological soaps and cosmetics; house clothes; house curtains; mobile phones; canopies; etc. All are small shops. Energy saving at households and smart meters were the policy issues in STAVE 2, 3. Therefore, two citizen groups were selected according to a clear segmentation criterion: a group with smart meters at home (STAVE 3), a group without it (STAVE 2). The smart meters were installed the week before the first STAVE meeting by the City Council Energy Agency. All participants were homeowners with children, living in buildings with similar constructive and climatic features, in the same urban district of BCN (according to the Energy Agency’s needs). "For sure, discussions have been entertaining"
"I think I've said all I wanted"
"I believe that in the meetings, it has been amply expressing the opinion of each participant"
"Pretty interesting. Teaching. Exchange of views interesting"
"We had enough time to share experiences and provide proposals"
A selection of citizens with the following specifications: age over 18, with all or some responsibility for purchase in the family, and the group should be mixed with regard to gender, age, and socio-economic status. Each group comprised: differences in age and income; household with singles, couples, families, single parents; varying occupations including: unemployed, employees, self employed, retired persons and students. Participants lived in flats and own houses, and represented both the countryside and the city. "Enjoyed discussions – open atmosphere and interesting to hear different views"
"Valuable exchange of knowledge, experience and insights"
"Great opportunity to convey messages to policy making level"
Overall approach: The substantive policy issue for the UK STAVE trials was consumers’ understanding of, and shopping behaviour towards, household kitchen appliances that are known as ‘white goods’ (e.g. washing machines, fridge, toasters, etc.). This choice was made during consultations between the UK research team and the policy partner based at the Centre of Expertise on Influencing Behaviours, DEFRA. Specifically, the UK policy partner was interested in consumer reasoning, everyday behaviour and expectations concerning produce durability and reuse, product lifetimes, and the purchase of second-hand products. The policy officials expressed a specific interest in white goods because of a lack of existing evidence on consumer practical thinking around these appliances, and a lack of clarity as to what might be viable policy options in this area. For the first UK STAVE group, the participants had to meet the criteria of being home owners, with a household income of above £45,000. Four of them had to have purchased a kitchen appliance in the last 2 years, and the other four had to have owned at least one kitchen appliance for at least 5 years. The STAVE 2 and STAVE 3 groups were run “in parallel” during November-December 2011, using the same venue, and facilitation and stimulus methods. In response to DEFRA’s stated interest in people’s behaviour at “moments of change” (getting married, splitting up, moving into a new home together, becoming single again, having a baby, retiring etc), we recruited the participants for the second and third groups on the basis of having either experienced a big life change of this nature during the previous 6 months, or anticipated such a change during the following 6 months. DEFRA also expressed interest in how people at the lower socio-economic levels behaved, so we recruited in order to create socio-economic comparisons between STAVE 2 and STAVE 3. STAVE 2 was recruited from standard ABC1 categories and STAVE 3 from C2DE. Both groups were recruited with the objective of achieving a gender balance and the presence of at least one person per group with an ethnic background. STAVE 2,3 participants were informed that the project was trying to better understand how people make decisions about shopping, and in particular about the purchase of white goods (i.e. refrigerators, cookers, washing machines etc.). "It was very interesting and varied"
"Found it very stimulating and interesting on a subject I wouldn’t normally thought too much about"
"The group covered most issues comprehensively"
"Very good input and makes you think about things"
"Excellent group meetings, thoroughly enjoyed them"